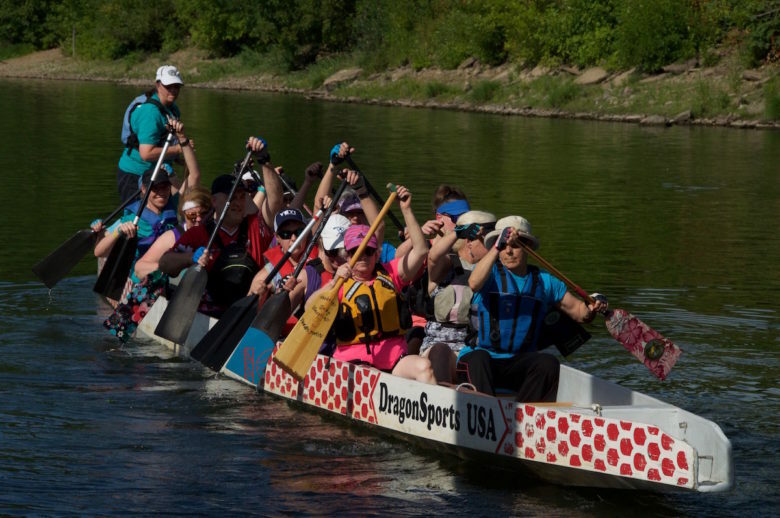 Its dragon boat season on the Willamette River in Salem Oregon and between now through October, you should look for them along the waterfront. A dedicated 20-member crew, called the Unsinkable Survivors, practices in the river three times a week from as early as March through as long as river levels stay safe. They race competitively four or five times a year. Hooked the first time she tried it, Julie Bryant paddled for several teams before she decided to start her own. 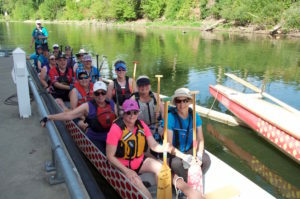 Salem didn’t have a dragon boat team for cancer survivors and support persons, so she and her friend and co-founder Patty Sherman created one. Born in Eugene and raised in Ketchikan Alaska, Julie graduated from Ketchikan High School. As a Special Education teacher, she holds a Bachelor in Physical Education from Oregon State University, a Masters in Education from Western Oregon University and an Administrative Certificate from Portland State University. “Each paddler in the boat has a role, from bench mates (affectionately called benchies) to the leaders who set the pace, the tiller who guides the boat and the caller who motivates the team to succeed, she explained. Dragon boating originated in China where the Dragon is a symbol of strength and luck. It is very popular in Canada, the United States, Europe and/or any place that has rivers, lakes or oceans where you can paddle the boats. The Unsinkable Survivors team has raced in Portland, at the World Beat Festival in Salem, the International Races in Nanaimo, B.C. 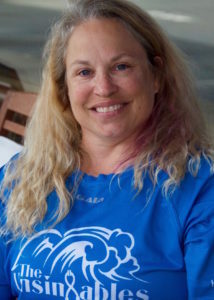 and will compete in the 7 Wonders Dragon Boat Cup on Wallowa Lake this August. “Anyone can paddle as long as they can get in and out of the boat,” Julie said. “We teach each paddler how to pull their own weight. We are first and foremost a community team for any survivor or support person but we are also very competitive. If paddlers rather not race, they are still welcome. The Unsinkable Survivors comprises people from 35 to 74 years of age with differing levels of fitness and skill impact from cancer treatment. 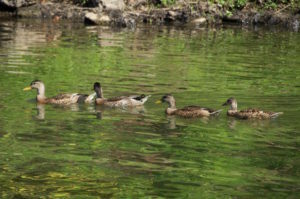 “We enjoy being on the water and especially love the ducks, osprey, eagles and herons. As stewards of the river, we pick up and carry out any trash we find in the water which usually always contains what we have fun calling ‘the shoe of the day’,” she said. Unsinkable Survivors, who come from Salem, Stayton, Aumsville, Silverton and as far away as Eugene, pay a modest membership fees. Both membership fees and sponsorships help cover racing fees and boat upkeep fund the club. 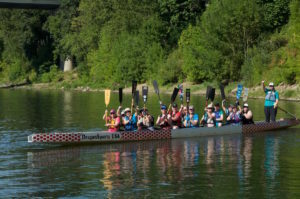 The Unsinkable Survivors is part of the Salem Multicultural Institutes’ World Beat Dragon Boat Club. For more information visit www.unsinkables.club. Caption for last photo: Unsinkable Survivors out for a practice run on the Willamette River are left to right from front: Judie Martinak and Patty Sherman; Katie Anderson and Raissa Flemming; Ann Scott and Jamie McGilvray; Sean Fornelli and Jeri Miner; Anna George Edison and Alison Kaiser; Jennifer Utter and Janita James; Jennifer Hunt and Tiffany Langley; Maggie Crawford, Tiller. 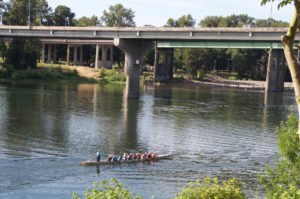 Enjoyed your article on ‘Dragon Boats on the Willamette River” Thank U for publishing it!